*What Length Hair Do You Want? Having long, lustrous locks can instantly improve one’s whole look and that’s one of the main reasons all girls pay a lot of attention to their hair. When it’s thick, voluminous, and lengthy, it just looks so much better. But unfortunately, not many girls have that kind of luscious strands and Mother Nature isn’t always so fair. Having thin, damaged, on short strands can be the source of a lot of frustration, but not anymore! We have the perfect solution for your strands – flat tip extensions made of strong glue. There is no better way to get that extra-long hair immediately, without having to wait months and years for it to grow out. Having problems with thin strands that lack density? Worry no more, you will be amazed by the glamorous volume extensions create and boost your natural locks. The best part about flat tip extensions is that they’re completely invisible and you can rest assured that nobody will notice it’s actually not your real hair. As the name says, this type of extensions have a flat tip which differentiates them from others. The reason why this is better is because the extension tip lays completely flat on your head and it can be camouflaged much more easily and feels so comfortable. And having extensions that are as comfortable as possible is incredibly important because you don’t want anything getting in the way of a perfect experience. The flat tips are secured using the hot fusion method, which is one of the most advanced. It is becoming increasingly popular because it allows a completely natural movement, realistic look, and increased longevity. If you’re tired of clip in extensions that you have to reapply every day, then you should really think about flat tips. What we pride ourselves on is giving you as many options possible when it comes to our products, and the same goes for flat tip extensions or sticky tips. We have hundreds of gorgeous shades that you can pick from in order to match it exactly to your natural hair color. That ensures a perfect blend and a realistic look. You can also choose a custom length, from 10 to 30 inches which means you have the option to go all out and have those extra-long tresses that you have always dreamed about. But that’s not all, our flat tip extensions also come in many different textures which means you can experiment with straight, wavy, and curly locks. Two main features of these extensions are the flat tip and the hot glue fusion application method. The flat tip ensures that the extensions don’t stick out near the roots and lay completely flat on your head. That’s very important because nobody wants their extensions showing. The hot fusion method is amazing because you get so much freedom of movement, which means you have infinite styling options. Whether you want to make a cool updo, or a high ponytail, the extensions will not be visible whatsoever. The flat tips, along with the incredibly strong glue that melts that are so comfortable to wear. This is crucial because flat tips are a semi-permanent method. That means you don’t have to reapply them every day likes some other extension types. If you’re a busy girl, this will definitely have a positive impact on your free time. Once you get the flat tips installed, you can wear them for up to two months, depending on your hair growth. It’s really simple! Another reason why glue in extensions are very popular is that they use the hot fusion method. That means the glue and heat is involed during the application process. This is a complete revolution when it comes to extensions and that’s why more and more girls are choosing this method. Your natural strands along with the flat tips are placed on strands and then clamped shut using glue melting pliers. It’s as simple as that! That makes the cold fusion method so durable and secure. There is almost no chance that any of the flat tips will slip out or get damaged. Maintaining flat tip extensions is also a lot easier compared to others. 1. Once you touch our flat tip extensions, you will want to touch them all the time. Their silky and soft texture will totally win you over! 2. Flat tips ensure that you will feel comfortable with your extensions. 3. Super strong glue is a great and long term method for applying flat tips. 4. Flat tips use the hot fusion method which requires heat for perma look. 6. Many customization options available! Because of their quality, ability to customize them, and increased longevity, AiryHair flat tip extensions are definitely number one. For any additional questions, read our frequently asked questions. Why Buy Flat Tip Hair Extensions? If you consider buying flat tip hair extensions, it is important to gather all the information about this type of attachment so there are no surprises afterwards. If you still can’t make up your mind, we have compiled a list of pros and cons of flat tip hair extensions. Let's take a look at the pros first. Let’s first explore the flat tip pros so you can see how great this method really is. Flat tips come in many different forms and the main distinction is between different hair types. 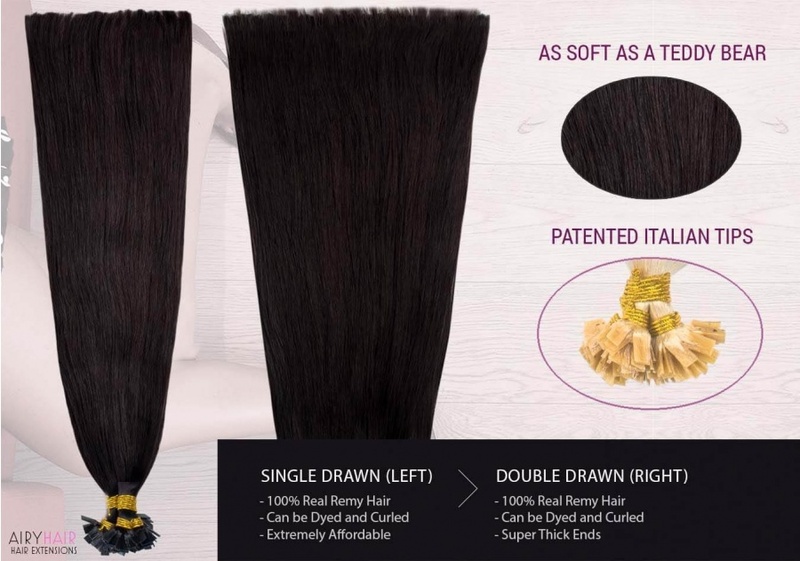 You can get human hair flat tips, including Remy hair. Because of their low quality and unrealistic look, synthetic extensions are rarely used anymore. 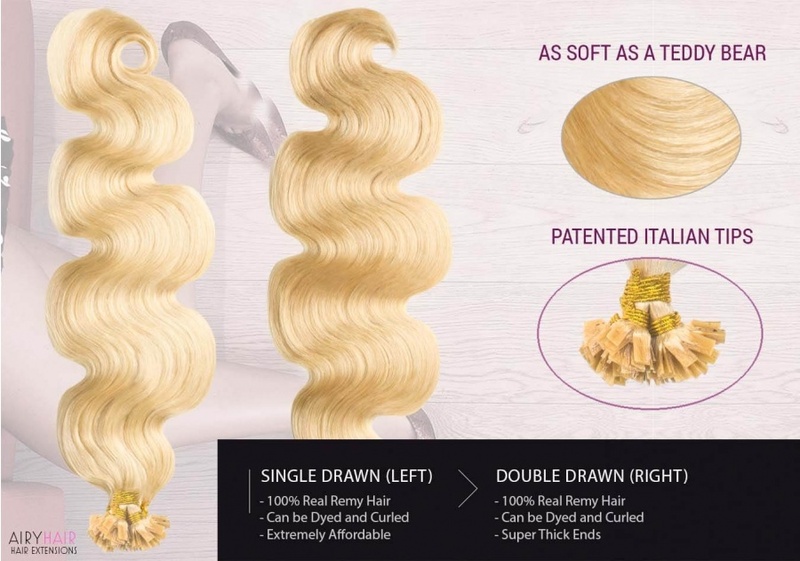 Human hair extensions have gotten pretty cheap and are affordable to almost everyone so there is really no reason for using synthetic strands. Adding 20 inches of length to your locks might have seemed impossible twenty or thirty years ago, but it is such a simple task nowadays. Flat tips come in all kind of different lengths so it’s totally up to you how much you want to extend your locks. Density is also a key factor in creating a stunning hairstyle. Those who have naturally thin and fine strands know how hard it is to style them and make them look fuller. When you add flat tip strands, you get an amazing amount of sheer volume that is instantly noticeable. Once you get that desired density and luscious long tresses, you suddenly realize that you’re not stuck with the same boring styles for thin or short hair anymore. Now you’re one of the cool girls with beautiful full locks and have so many different hairstyles to choose from. When you have short hair you can forget about braids, ponytails, glamorous updos, waves or simply letting your strands flow as the wind blows through them. Long hair allows you to try literally anything, so you don’t have to be frustrated when watching those amazing YouTube hair tutorials. Flat tips allow you to be that girl. Although flat tips are certainly not the easiest extensions to install, the process is still simple and can be done at home with some help from your friend. This way, you save a lot of money that would otherwise bet spent at a salon. Because of the installation method, once the flat tips are applied, there is almost no chance of them falling off. The bond is very strong and holds the strands together tightly. So, if you maintain and care for the flat tips, you don’t have to worry about them coming off, and simply enjoy your new strands. 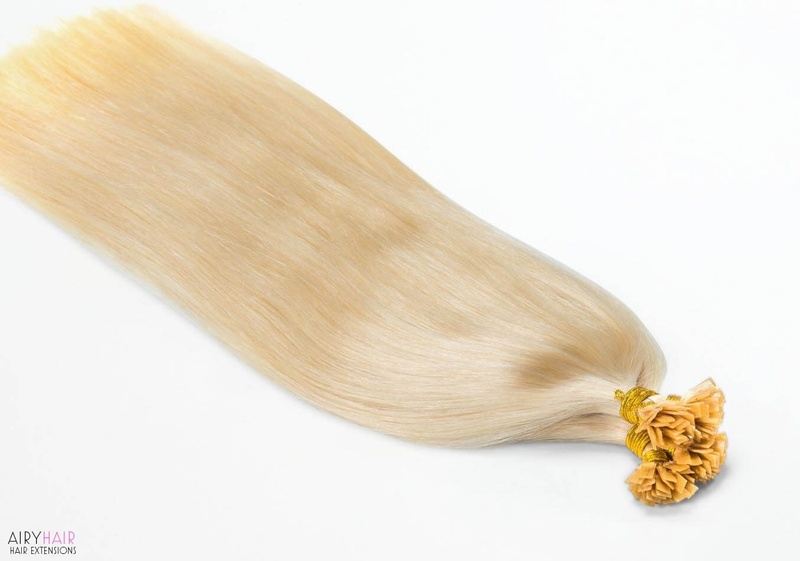 Flat tips come in individual strands which, when applied, are much more comfortable to wear than big wefts. They become so integrated with real strands that you can barely feel them after a while. If you do feel like the extensions are uncomfortable or any kind of strain or pain, that means that the flat tips were probably installed too close to the scalp. If that’s the case, remove them and re-apply. Many women love using flat tips because they’re a semi-permanent method, unlike clip-in is, for example. The semi-permanent nature of this extensions is particularly appealing to busy women who don’t have time to install and remove wefts every single day. Although the flat tips need to be removed and reinstalled every two to four weeks, you can still use the same hair multiple times. That’s a big plus because having to buy new extensions every month would be very expensive. If you want something that is easier to install on your own, consider invisible tape extensions. It might seem like flat tips are a lot of work, but that’s actually not the case at all. This type of extensions are pretty low maintenance you can treat them pretty much like your own tresses. Just don’t pull or tug on them and you should be fine. It is enough to wash them two times a day and brush to remove any tangles or frizz. Since flat tips have a unique flat shape, it is almost impossible to detect them. They lay completely flat against the head and are very tiny. So if those who are looking for an extension method that is truly invisible, definitely consider flat tips. We don’t want to simply praise flat tip extensions without mentioning some of the less positive aspects, here are some of their cons. Although anybody can learn to install flat tip extensions, more advanced user will find it much easier. Once the flat tips are applied to the strands, it’s not so easy to remove them so applying them correctly the first time is crucial. Those who are not so confident in their skills are better off going to a salon and having it done professionally. Currently, there are no extension methods that you can simply install and never have to take off again. Be it hair wefts, tape ins or keratin hair. Flat tips are no exception and although they’re considered to be a more permanent extension method, they still need to be occasionally refitted. When the flat tips are applied to the natural strands, they move along with them as they grow. The more the strands grow, the more flat tips become visible because they’re pushed down. That’s why they need to be refitted every four to eight weeks, depending on the speed of hair growth. Although this happens very rarely, sometimes the flat tips can come off. This usually happens when people don’t follow the maintenance instructions and somehow damage the tips. Aggressive scrubbing around the scalp area might result in the tips getting loose and eventually falling off. So be careful when washing the extensions and scrub gently. Another way to damage the flat tips is by aggressive brushing or pulling. Any strong force applied to the tips might result in detachment. How to Install Flat Tip Hair Extensions? 1. Start by parting your hair. The flat tips will be in horizontal rows, starting from the bottom and going up, so that’s how you should part your hair. Begin with the first section at the nape of your neck and move upwards from that. 2. Now that you have your horizontal parting, you need to separate a very small section of hair that will touch the tip. If the strand is too big because it will not cover the entire tip. 3. Now is the time to insert the flat tip. Place it underneath your natural strand and hold them both together with your fingers. 5. Check if the placement of the tip is right, because it shouldn’t be too close to the roots. If it is, move everything down slightly. 6. Use the hot pliers to melt the glue and ensure it is properly closed. 7. Repeat these steps on other strands, going up one row each time. Don’t place the tips too close to the top part of your strands so that you avoid visibility. If you need more help or don’t want to do it yourself, contact your hair professional. How Are My Hair Extensions Shipped to Me?